I wanted to share this OOTD because it is really so simple and it looks so cute. It is truly a look that would look great on anyone! Beneath it I’m wearing a turtleneck sweater from H&M. When it is so cold outside, these really are magical. 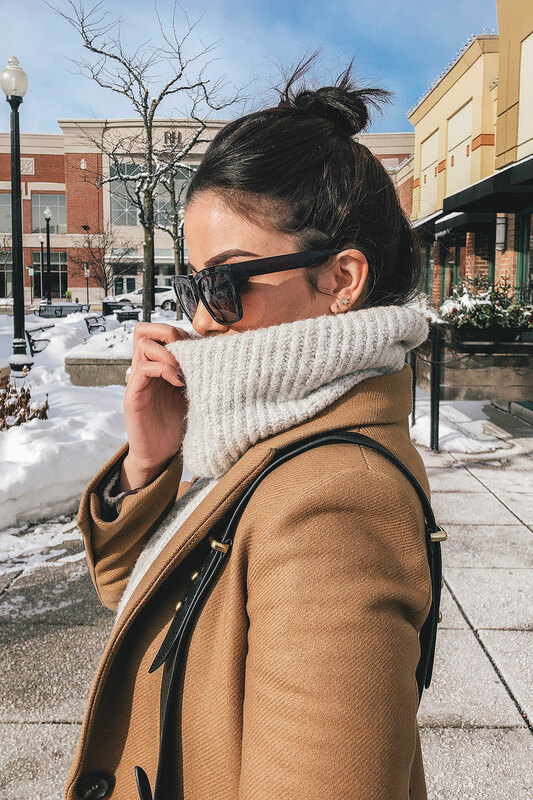 I think it is safe to say we all probably have a fair share of scarves in our closets, but if you’ve got a turtleneck sweater there is no need to fuss with a scarf. You know that feeling of tucking your face behind a scarf, blanket, oversized sweater, or turtleneck? That instant feeling of warmth and comfort? I can’t be the only one. Anyway, this turtleneck sweater gives you that feeling. And on a cold day, not much can beat it. I’m wearing a pair of Guess skinny jeans tucked into my Dr. Marteen boots. I love how these boots give this look a playful element. Truly you could wear any type of boot with this look though- combat, ankle, knee high, work boots, you name it! I picked my black Prada purse to go with this look, but you could take advantage of the opportunity to use your favorite colored bag also!